Angels Torun won in Brwinow near Warsaw against Beagles 13:22. On the QB position - Angels had the sixteen year old Kornel Mierzejewski. Friendly game in Brwinow is another step in preparation for Angels in the second division Polish football league after meetings with the finalists of the first league Husaria Szczecin and Lowlanders Bialystok. To Brwiow (50km from Warsaw) came all the American players of Warsaw Eagles: Clarence Anderson, Jamie Boyle, Caleb Singleton, Blake Wayne and Andre Whyte. Angels played without their starting quarterback - Lukasz Kusmirek, who had a minor shoulder injury, and was successfully replaced by Kornel Mierzejewski. 16-year-old Polish Junior Championships (PLFAJ) finalist with the Angels last season and Polish Junior Champion in 2012 with other six Angels junior players guest started in... Warsaw Eagles. Beginning of the match was not good for the "blue sky-whites", in second game play Bartosz Rot after half field run scored a touchdown. But Torun quickly responded with a long 65-yard pass by Mierzejewski to Mazan. The second quarter was the Angels show: Bartosz Mroz kicked a 35-yard field goal, Tomasz Kuska ran an 8-yard touchdown. But the highlight of the game was the reverse play by Jakub Mazan running along the field and even danced between opponents. In fourth quarter - again Bartosz Rot set result 13:22. Game was full of spectacular passing, sacks and steals. This was not the first Torun football game in the city where there is no league team, previously co-organized the matches in Inowroclaw and Ciechocinek, and also shows football in Wloclawek and Gniewkowo. "I am very happy that the Angels accepted our invitation and came to play a game to Brwinow. It is hard to say that their response surprised us, because we knew that they are a good team. First of all, we lost in the offensive line. This formation is now completely rebuilt and based on our last year's juniors. Coach Moore tactics proved was very good - we had trouble stopping defenders of Torun. Very cool also performed their young quarterback - good to see both teams that work with juniors pays off"- said offensive coordinator Marcin Lojewski. "Fans watched interesting spectacle, which does not run out of hard struggle but the friendly atmosphere of a typical pre-season games. I hope that both teams face in the PLFAII playoffs and this time we will be on top. However, this time both teams have even a moment to clarify a few details tactical and technical. I would like to compliment our special team blocking kicks, which twice stopped Torun very good kicker." added Lojewski. Angels and Eagles lead the junior teams (14-17 years) who participated successfully in the Polish Junior Championship (PLFAJ). "This was a quality win for the club. Any time you can go to Warsaw, and beat any of the teams that come from the Eagles programs, you have achieved a quality win. The first two sparring matches have really helped our rookies, because we were missing some players and we were able to use guys that have been working hard and getting better not miss a beat. We still got some issues that we need to work on, and we are still not the team I know we can be, but we are getting better, that is for sure. "We did a lot of good things on defense and gave up one score in the first half and one score in the second half. I am very pleased with what they did and how they executed, but more importantly, how they learned on the fly and took instruction during the game. That didn't occur in the first two sparrings as well as it did on Sunday. We simplified our play calling which helped a lot and we got pressure on their QB and ended up with 5 sacks by games end. There were a lot of positives but we still need to work on stuff that we got burnt on. Our tackling can be better and we still are in a bad habit of over pursuing which opened up their two scoring chances. All in all though, only giving up 13 points was a real plus for our defense and something that we can build on"- thinks about his defense coach Moore. It was the last friendly game Angels Torun had before PLFA league season. Previously in Torun, Angels played with finalists of the Div-1 Husaria Szczecin and Lowlanders Bialystok. 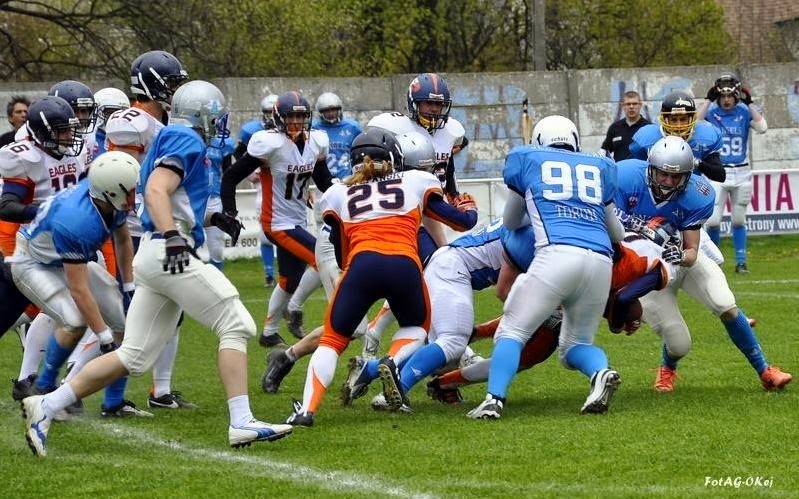 Angels PLFA season begins in Slupsk against the local team Griffons on May 3rd.